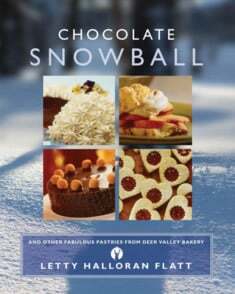 I wrote Chocolate Snowball, the cookbook, when I was Deer Valley’s pastry chef. I was elbow high in butter and sugar by day, while my cooking at home has always been healthy plant-based and vegetarian. Letty’s Kitchen blog comes from wanting to share seasonal, whole food, vegetarian recipes with readers like you. 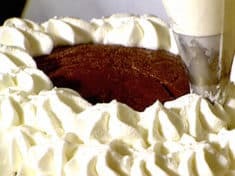 Chocolate Snowball, the cookbook, takes its name from the gluten free cake, Chocolate Snowball, which is baked in a bowl, inverted, and piped with whipped cream snowflakes. This cookbook was written for all levels of bakers, with recipes for breads, cakes, pies, ice cream, and desserts, each rated according to ease of preparation. Look for the same symbols ski areas use to rate their trails, Easier, Intermediate, Advanced and Expert. My cookbook is out of print, but you can buy Chocolate Snowball for Kindle, as well as paperback and hardcover copies (super-discounted) through my Amazon affiliate. This rich gluten free dessert is baked in a bowl, chilled, and inverted onto a platter. Whipped cream snowflake stars get piped all over the outside. It's a suprisingly easy dessert to master. Makes one 8-inch snowball, serves 10 to 12. Preheat the oven to 350°F. Line a medium (5- to 6-cup, about 8-inch diameter) stainless steel bowl with aluminum foil so the foil overlaps the bowl 3 or 4 inches. Put the chocolate in a saucepan. Pour the coffee over, which will melt some of the chocolate. Place over medium-low heat, add the sugar and stir with a wire whisk to dissolve the sugar and any unmelted chocolate. Add the butter gradually, a dollop at a time, whisking until the butter is incorporated before adding the next dollop. This should take about 10 minutes. Remove from the heat. Slowly whisk the beaten eggs into the chocolate mixture. Pour through a strainer into the foil-lined bowl. Discard any firm bits of egg that remain in the strainer. Bake 50 to 55 minutes, until the batter rises and a cracked top crust forms. The mixture will still jiggle, like molded gelatin; resist the urge to bake it a little more; the butter and chocolate set up when chilled. Let the cake cool. Fold the overlapping foil over the top and refrigerate at least 8 hours, keeping the cake in the bowl. Remove the plastic wrap from the bowl. Pull the overlapping foil away from the cake. The cake will have fallen in the center--to make the top flat and even, press the raised outer edges down. Or trim the extra height with a knife, reserving the scraps for indulgent snacks. Place a flat serving plate or cardboard circle over the bowl and invert. Gently remove the foil. Whip the cream with the sugar and the vanilla until the cream comes to soft peaks that hold their shape. Put the cream into a pastry bag fitted with a large star tip. Pipe stars, covering the dome completely.